Al Sawatzky, Construction Manager, Line 3 Replacement Program with Enbridge Pipelines, left, and federal Minister of Public Safety Ralph Goodale watch as pipe is loaded up for the Enbridge Line 3 replacement. 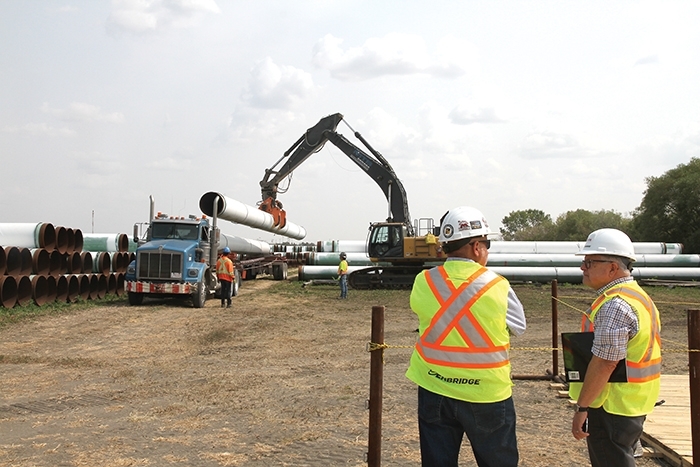 The town and RM of Moosomin are trying to revive consideration of another pipeline project--Energy East. The town and RM of Moosomin are pushing for reopening the discussion on Energy East. The town and RM have formed the Energy East Development Committee to promote the development of Energy East, and former SARM president Sinc Harrison has agreed to work on the communities’ behalf, promoting the resurrection of Energy East. As well, the Moosomin Chamber of Commerce has invited the three main federal party leaders to attend a public forum on pipelines in Moosomin this fall, if a date can be found that works for them. Energy East was a proposal by TransCanada Pipelines to repurpose part of the existing pipeline across Western Canada and Ontario from natural gas to oil, and build new pipeline through Quebec and New Brunswick, to take Western Canadian oil to eastern refineries in Quebec and New Brunswick, and potentially to an export position at St. John, New Brunswick. TransCanada withdrew its application to the National Energy Board for approval of the pipeline after the federal government announced a change that would take all upstream and downstream emissions into account for any future pipelines. Moosomin would have been a major beneficiary of Energy East as TransCanada planned a 1,050,000 barrel tank farm at the Moosomin compressor station, a feeder pipeline from Cromer to Moosomin, and potentially an additional pipeline from Williston, North Dakota to Moosomin. The town and RM had sent resolutions to the Saskatchewan Urban Municipalities Association and the Saskatchewan Association of Rural Municipalities in the fall, calling for the organizations to lobby for the reinstatement of Energy East. Since then, SUMA president Gordon Barnhardt has met with TransCanada to discuss the issue. Barnhardt also recently met with SARM president Ray Orb to discuss the issue. Souris-Moose Mountain MP Dr. Robert Kitchen said he is happy to see the town and RM working on raising the issue. “I did see the invitation you sent to the leader’s office, and I was extremely pleased to see that, and I’m pleased to hear that the community is working together to create this committee and bring this issue forward,” Kitchen said Friday. “I am 100 per cent behind the thought process on that. “I can tell you that Andrew Scheer has said he is in favor of re-looking at Energy East when we become government. This, to me, is a tremendous thing. “In any type of issue the proponent needs to know there is confidence in the marketplace to invest in it. That confidence comes from knowing there is support out there, there are assurances out there to advance the issue. “I truly believe that is something I and Andrew Scheer will continue to talk about. He said the committee should do a good job of keeping the issue in the public eye. “I think it’s important to keep it in the public eye and to highlight the issues,” he said. “Saudi Arabia is sending oil to Canada, and there is also oil coming from the U.S. into the Saint John Refinery. We are using foreign oil in eastern Canada when we could be self-sufficient. We need to highlight that. We need to highlight the need for Canadian jobs. We need to look at being self-sufficient on our natural resources and creating employment across the country. We need to make sure it’s out there and people see it. Mayor Larry Tomlinson said he has already heard of support from other parts of the province. “I had talked to Gordon Barnhart and told him what we were up to,” said Tomlinson. Tomlinson said he believes Energy East would be a huge boon to the Moosomin area if it were to eventually go ahead. Sinc Harrison said he’s happy to work on behalf of the municipalities to try to reopen discussions on Energy East. “The resolutions were passed by both SUMA and SARM, but unless somebody pushes these organizations, sometimes they have one meeting and that’s it. “When Saudi Arabia had taken some action against Canada, people were asking where eastern Canada was going to get its oil from. This is a good time to bring back this idea, because the Saudis have brought the need for it to the forefront again,” he said. “I’ve discussed it with Ray Orb, president of SARM, and the president of SUMA, Gordon Barnhart, and they were to meet last Wednesday to discuss what common action could be taken. When I get back from Ontario I’ll follow up with them. “One thing Ray Orb said was that the Federation of Canadian Municipalities hope to meet with the mayor of Montreal at their meeting in September. That seemed to be a stumbling block before, that the mayor of Montreal was opposed to Energy East, and then there was a new mayor elected. Harrison says he sees his role as “doing whatever it takes to get things going again. Maybe it won’t have any effect, but if you don’t try, nothing happens. I want to talk to SUMA and SARM again and see what their course of action is. “If they aren’t going to take much action, I’ll see what we can do. It’s important for us in this area.